What’s going on with DACA? 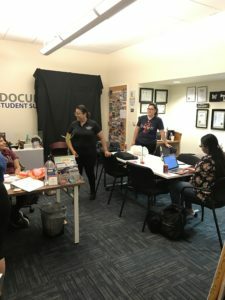 Inside the resource center, there is room to work and people to help.The Undocumented Student Success Center (USSC), located in the Santos Manuel Student Union, is open to any questions relating to the status of the Deferred Action for Childhood Arrivals program (DACA), scholarships available to undocumented students and events held on campus. Created by President Obama in 2012, DACA grants temporary legal status to those who meet a list of qualifications. According to a FactCheck.org article by Lori Robertson, there are approximately 689,800 active DACA recipients in the U.S. Since the start of President Donald Trump’s first term, the status of DACA has become a complicated topic. On Sept. 5, 2017, President Trump decided to rescind DACA, meaning to end all active and renewal applications. The resource center is located in the SMSU. Those whose DACA status was active before March 5 were allowed to renew for another two years. If their status expired after March, 5 it was terminated. This put a lot of stress on the undocumented community. Federal Judge William Alsup temporarily blocked Trump’s repeal shortly after it was attempted. The repeal of DACA would affect thousands of individuals who have been allowed work permits, driver’s licenses, and an ability to get an education. Rescinding it is not simple and doing so would have a huge impact on the country. Currently, the Department of Homeland Security is still taking renewal applications for applicants who continue to meet all of the qualifications. However, the department is no longer abler to process first-time applications for DACA. Due to stress caused by the uncertain status of DACA, many recipients have stopped renewing their applications. One of the biggest fears they face is separation from their loved ones. “You don’t know what is going to happen next. The situation makes you feel anxious. I feel like I am at a state of limbo. People are so quick to rescind it bring it back and make changes at any time,” said Eduardo Soto Gutierrez, a DACA student. 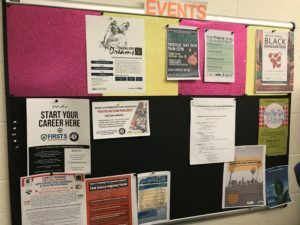 One of the boards in the center is full of events you can attend to get more involved. USSC employee Leticia Herrera has some advice for students with DACA. “For my undocumented community, don’t give up. Follow your dreams. Use the Undocumented Student Success Center for resources. DACA does not define you. You are more than a 9-digit number. They can take anything but not our education,” said Herrera. Minerva Montane also works at the USSC. “For those who meet the qualifications to renew your application, get help from the right people. 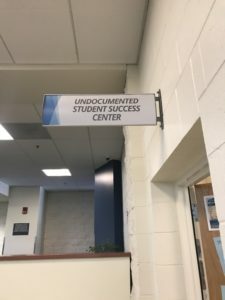 Come to the Undocumented Student Success Center for advice and referrals to organizations that can potentially provide you with free help,” said Montane. It is important that CSUSB students receiving DACA know that they have help on campus. USSC employees are willing to assist you as much as possible. If you have questions they cannot answer, they are more than willing refer you to the right people. DACA is still not a permanent program and decisions regarding it are still up in the air. News surrounding it is constantly changing, but it is important to stay informed. Be informed, and if you have any questions, ask.